The products featured in this post were provided to me free of charge courtesy of Seven Oaks Farm. This post may have affiliate links but this in no way will influence the review to follow and all opinions are my own. Garlic Gold Oil – Organic Extra Virgin Olive Oil and Meyer Lemon Vinaigrette: I did not know what to expect when I tried the olive oil, as I have limited experience with anything other than generic store bought olive oil. The Garlic Gold Oil – Organic Extra Virgin Olive Oil was a clean and solid taste that was infused with garlic. I used it to make the chicken and it was the perfect cooking assistant and added much needed flavor to a otherwise flavorless meal. I used the Meyer Lemon Vinaigrette on a salad, and WOW!! It was so good that we have been rationing the portions so we have plenty of salads ahead of us. This is not an overpowering lemon taste, but enough that leaves no doubt it is lemon. If you are a fan of lemon (which I happen to be), you have to try this! 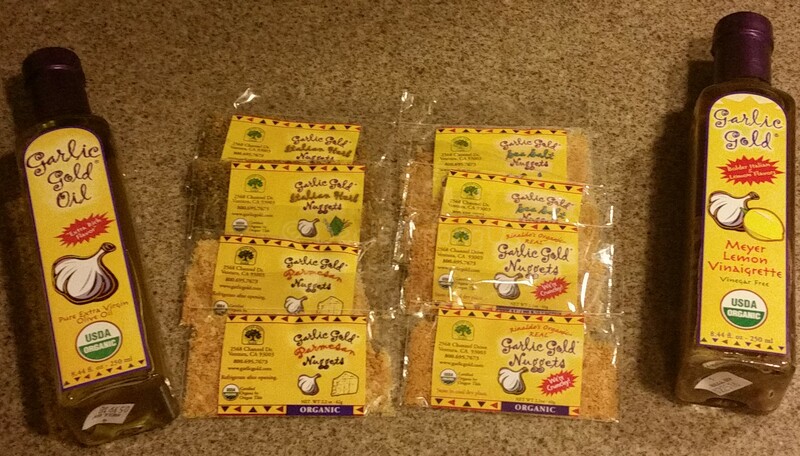 Garlic Gold Nuggets, Garlic Gold Italian Herb Nuggets, Garlic Gold Parmesan Nuggets and Garlic Gold Sea Salt Nuggets: I was able to try four varieties of these and each one was great. I used Garlic Gold Nuggets in my chicken and used the Garlic Gold Sea Salt Nuggets on broccoli. Each flavor I was able to taste the garlic without it being overwhelming. The Garlic Gold Parmesan Nuggets were awesome added to the top of pizza and the Garlic Gold Italian Herb Nuggets was beyond good in spaghetti. These would add a needed element to anything you added them to, in addition to adding a versatility in taste. 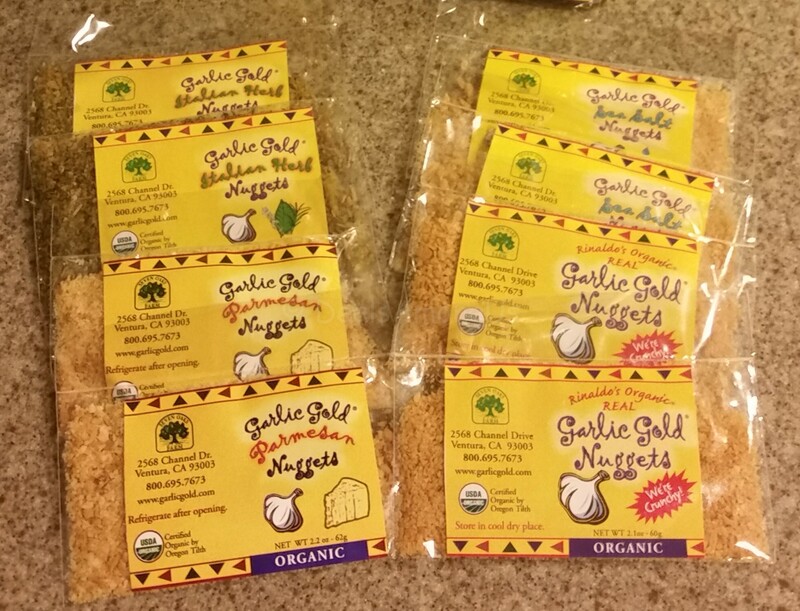 Garlic Gold’s products are 100% USDA Certified Organic, Gluten-Free, Vegan and hand-crafted. This means that you are getting a pure and healthy crunchy treat. While many introductions that you will encounter in life have to potential of being unknown and scary I can assure you, your introduction to Garlic Gold will be easy and long overdue. Now that I have been introduced, there is no going back. I can not imagine not incorporating these products into my nightly cooking routine – they are that good! I encourage everyone to give any of these products a try – you may just meet your new BFF! GIVEAWAY: Garlic Gold is offering a gift pack to my readers! (1) lucky winner will be selected at random to win 1 – Gift Pack that includes 1 – 8.4 oz bottle of Extra Virgin Olive Oil, 1 – 8.4oz Meyer Lemon Vinaigrette, 1 – 3.75oz Garlic Gold Sea Salt and 1 – 2.3 oz Garlic Gold. A $37.95 value! I will be randomly choosing 1 person on November 23 (11/23/2015) to receive this gift pack! Open to residents in the US only. To enter complete the entries below! Winner will be notified by me by email and prize will be fulfilled by Seven Oaks Farm/Garlic Gold. Remember you have 48 hours to claim prize, or I will choose another winner. GOOD LUCK!!! Win a Garlic Gold Gift Pack!! I love Garlic when it’s infused in a high quality EVOO. This is delicious! I love garlic powder sprinkled on different foods. I LOVE garlic in so many dishes… Italian, Mexican even. And who doesn’t love garlic bread? Or garlic olive oil, on some fresh baked bread? I like it roasted and served with fresh baked crusty bread. Everything is better with garlic! I like to chop raw garlic on fresh sliced tomatoes with parsley, basil, olive oil and wine vinegar. We use garlic in pretty much everything! We love garlic! My favorite is on bread and in italian food! Oh, I also love it on my pizza crust! Our favorite way to have garlic is with fish fillets. What is your favorite way to have garlic? My favorite way to have garlic is every way-especially garlic bread! I love Roasted Garlic on rolls! My favorite way to have garlic is sliced and sauteed in vegetables and pasta dishes. I love garlic in everything, one of my favorites is just garlic, pasta, olive oil and some sea salt. I like garlic on pizza. I like to make roasted garlic and spread it on sourdough like butter. I serve it with a homemade brucshetta. Can’t say we have a fav. I am so glad I saw this post, I have forgotten about this brand & plan to seek it out. I love garlic and eat it in some way every day. Just minutes ago, I made an Asian Vinaigrette dressing for tonight’s salads. The recipe called for a clove of garlic…I tripled that. I use it in almost everything I cook. I love garlic on baked fish. We literally use garlic in every single meal somehow! We are garlic addicts! I think if I had to pick, I would say that pickled whole garlic cloves are my fave! I always add garlic to my pasta dishes. Yum! I love garlic roasted in the oven and then used as a spread on bread. I love using garlic in my Pasta with Lemon and Garlic recipe. It is so delicious! I love garlic sprinkled on my pasta and in my veggies! Yummy! I love garlic! My favorite way to have garlic is on a buttery garlic bread. I use garlic in almost everything I cook. I love roasting garlic and dipping bread into it. I like it any way I can get it! With cooking, my favorite is in homemade Alfredo sauce. When I feel a cold coming on, I eat a little raw, chopped garlic on toast- it really helps! I’m a big fan of garlic popcorn of all things! Have you tried that yet? I #LOVE garlic on ALMOST everything! Spaghetti, bbq’s, roast and SO much more! I love it with my linguine and clams..YUM! I like using olive oil with my vegetables. I put lots of garlic in my homemade hummus recipe. Yum!!! The “Lemon Vinaigrette” sounds interesting! Our family loves garlic! Especially cheesy garli bread! I use garlic daily in my meals. I love that is delicious as well as offers many health benefits. I like garlic in my pasta. I like on many dishes but pick fried chicken. I love pizza with lots of garlic. I like to have it on my steak. I put garlic in all my soups, stews and sauces. I use garlic in so many dishes. I guess my favorite way to enjoy garlic is with sautéed vegetables. I love my garlic stuffed in olives! I use garlic to flavor lots of savory dishes but my favorite is roasted garlic. I love Garlic in my Pasta and just using it saute my veggies. YUM!!! I always have garlic in any of my potato recipes! I like garlic with pretty much anything, but garlic bread is very addictive to me. i like it in broccoli and shells. I love having garlic in soup! It’s just that missing puzzle piece to put all the flavors together! My favorite way to have garlic is garlic bread. I love garlic with any pasta. I like to cook chicken with garlic. The more the better!